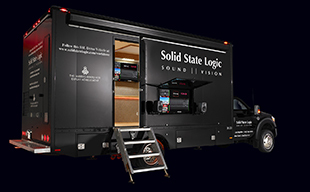 The SSL Live control surface brings decades of design experience to the specific demands of live sound production. The result is an uncluttered design that is intuitive and ergonomically efficient with a collection of unique features to keep the operator in complete control at all times. The system lets you use your own balance of touch screen and hardware control to work the way you want to. A single super bright, high resolution 19" multi-touch screen is the heart of the console and can be used for system & I/O configuration, creating surface layouts using the Layer Manager, the Automation interface, the Effects Rack and two different views of your project; The Channel View and Console Overview. The Channel View provides a clear and logically organised overview and interface for detailed channel information. This GUI corresponds to the faders in the Fader Tile and provides touch access for all path functions. SSL Eyeconix displays ensure that channel identification is immediate. The meters can be expanded to give a large-scale view. Double tapping individual channels opens up detailed GUI’s that provide intuitive configuration and multi-gesture control for a menu of operations including; routing assignments, VCA’s, Aux’s, Stem Groups, EQ, Dynamics, the All Pass Filter and Panning. Live allows changes in path processing order and bus architecture on the fly through straightforward drag and drop actions. An at-a-glance view of the whole console’s signal flow is essential. The Console Overview provides this on a touchscreen that enables the operator to immediately identify and access a channel or bus that needs attention. Selection of any channel or bus to the Focus Fader and Channel Tile is literally one press away at all times. With meters and bright red overload indicators for every input and output, identifying issues is easy and a single press brings a full set of path controls to hand. A dedicated Automation interface can be displayed on the main screen or an external monitor/touchscreen. Keeping control of even the largest sessions is very straightforward with Live. It is an open architecture system that allows the user to place any Channel, Stem Group, VCA, Aux, Master etc anywhere on the available Fader Tiles using a beautifully straightforward drag and drop Layer Manager interface. Whether at FOH or Monitors, Live allows you to create your own personal perfect layout. The combination of superbly elegant Layer & Banking and Super Q hardware controls and excellent touch screen layouts make navigating and controlling sessions extremely fast and superbly comfortable. With L500 Plus a Tablet can be used to bring additional touch screen control over Channel Processing and Effects Rack processing using the SSL TaCo tablet control application. Additional screens connected to external PC's or touchscreen laptops running SOLSA can be arm mounted to the console to bring yet more touchscreen control options. The visual cues the operator receives from a console are vital and Live uses colour beautifully. Within the fader strips a single large LED strip is used to identify and organise the type of signal path (VCA, Aux etc) or the instrument group (drums, vocals etc) assigned to the fader. The colours used are freely definable by the operator. Controls designed for parameter editing (Aux send levels, EQ & Effect parameters etc) on screen and in the Quick Controls also use user definable colour coding. What is selected in the touch screens and the various sets of edit control hardware can be set to always follow each other. In a console with banks and paging, speed of channel identification can make the difference between embarrassment and excellence. 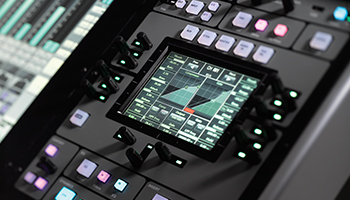 SSL’s unique Eyeconix display enables bitmap images to be displayed with each channel greatly reducing the time taken to identify and access the desired controls. The Live Channel architecture is easy to configure and extremely flexible. Channels have their own dedicated processing power and can be full with complete processing or dry and consume less processing power. Full channels have an unrivalled set of process tools with hi and lo-pass filters, four band parametric EQ which carries the legendary SSL tonal character (switchable between Legacy or constant Q), compressor with a new tube ‘warmth’ effect, expander/gate, delay, panning and all pass filter. There are two insert points. Dry Channels have no processing tools, two inserts and use less processing power. The Channel setup panel in the touch screen makes configuration and routing fast and intuitive. Channels can be mono, stereo, LCR, 4.0 or 5.1 and there are configurable foldown options. SSL Live consoles introduce a new type of signal path not found on other live consoles which we are calling the Stem Group. It functions in a similar way to a traditional subgroup, however a Stem Group has an increased feature set that makes it enormously powerful. A Stem Group is a unique type of hybrid mix bus that takes the key functions of a Sub Group, an Input, an Aux and a Matrix and rolls them into one extremely powerful tool. Stem Groups offer incredibly flexible routing options within the mix engine not found on any other live console. As with all other path types they can be configured in mono, stereo, LCR, 4.0 or 5.1. Both full and dry versions are available. Stem Groups offer truly new and powerful ways to think about mixing and offer flexible solutions to manage your creative environment. Unique to Live is the ability to change the order of path processing blocks for Channels, Stem Groups, Masters etc in real time. A simple ‘block swipe’ user interface in the main touch screen allows elements to be dragged and dropped to any point in the signal path giving absolute flexibility. Sprung boom arms can be mounted on either or both sides of the console. Arms can be specified as screen mounts or laptop/utility trays. External screens can be connected directly to the console to display the Console Overview screen or Automation screen. Screens connected to external PC's running SOLSA can also be mounted. Fader Tiles are freely configurable to control any signal path, with clear bright colour coding. Users can lay out channel/path types across the console to precisely match their own workflow. Fader Tiles are independent. Each Tile features 12 fader strips, with five layers of five banks giving up to 25 banks of 12 faders per Tile. Layer and Bank keys with LCD displays provide rapid layer and bank navigation. Each strip includes a touch sensitive 100 mm motorised fader, Solo, Mute, Query and Select buttons, individual LCD display and a set of Quick Controls. Alongside each channel fader are 14 segment level meter and separate gate and compression meters. A collection of menu buttons select various aspects of the Tile’s functionality, including ‘Swap’ which allows any bank to be set as a ‘Home’ set of strips. A ‘Screen’ key assigns the entire tile as the controls for the screen mixer view, so any Fader Tile can be used as the master. SSL has been implementing layer and bank based channel layout and navigation for more than 20 years in our digital broadcast, music and post consoles. The Live system is elegant, flexible and delivers a highly customisable workspace that keeps even large scale projects organised and accessible. Each fader tile can display up to five scrollable layers. Each layer has up 5 vertical banks, with each bank having a dedicated call button (layers and banks are color coded and can have user text to identify them). Channels can be organised in any order anywhere within this structure. At its upper edge each Fader Tile has a row of twelve ‘Quick Controls’ (a push/select control and three buttons). The Quick Controls can be assigned to the same single parameter for all channels console wide (eg Input section, Aux’s etc) using the Fader Tile controls, or from the touchscreen in Channel View. Alternatively, the entire row of Quick Controls in the Fader Tile below the touchscreen can be used in Follow Detail mode as individual parameter controls for EQ, Dynamics, or Effects parameters etc. The Quick Control rotary functions can be flipped onto the faders. The Channel Control Tile and the Focus Fader in the Master Tile both follow the selected channel and effectively combine to form a ‘Focus Channel’. 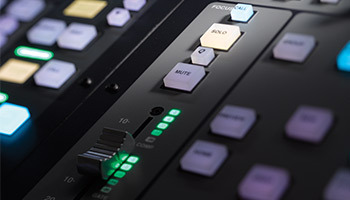 The Focus Fader places a full single fader strip in an optimal ergonomic position on the console to provide the fastest possible means of addressing issues with any selected channel. The Channel Control Tile provides its own independent combination of multi-gesture touch screen and hardware control. It provides a streamlined way to assign all of the parameters of a specific processor on a selected channel to a set of hardware controls that will be immediately familiar to analogue console users. The essential tools of the live mixer are provided in abundance. Any fader can be assigned to a VCA. Mute Groups have a dedicated bank of buttons in the Master Tile. Any channel can be assigned to a VCA or Mute Group within the channel assignment menu on the touch screen. 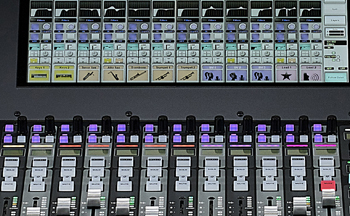 The Main Fader, also located in the Master Tile, has its own metering, solo/mute and Query buttons and can be assigned to any Channel, Stem Group, Aux, VCA, Master, Solo or Matrix output. SSL’s acclaimed Super-Q system offers unprecedented workflow flexibility from the touch of a single button. Super-Q allows the user to ‘spill out’ the contributing elements or destinations for a selected fader/path across the control surface. It works for all path types; pressing a channel’s ‘Q’ button in the Fader Tile, or in the touchscreen or TaCo Screen Query interfaces, shows the mix buses to which the channel is routed. Querying a mix bus will show only the channels that are contributing to that mix. Pressing a VCA’s Q button will show all channels under its control. Super-Q also shows the send levels to and from mixes, allowing instant and accurate mix control, either from a channel- or mix-centric view. These contributions can be displayed either on the rotary encoders at the top of each fader strip or automatically ‘flipped’ onto the faders. Super-Q has two modes; ‘Compressed’ mode shows a focused view of only the audio paths contributing to or from the Queried path. ‘Expanded’ mode offers user-defined layers and banks, allowing the user to lay out exactly where they want each channel to appear on the surface. The modes are configurable on a per-path type basis, giving the user complete control of their workflow. A new “Query to Focus Fader” option assigns the queried path to the Focus Fader. A new Clear Query User Key provides a rapid method of exiting Query mode from the same button every time. Sometimes the simplest things are the best. Our unique Spill feature enables the individual channels within a 5.1, 4.0, LCR or stereo path to be folded away under a single fader. Spill then lays them out on demand across the adjacent fader strips for relative adjustment or editing... when you’re done fold them away again. It saves layout space and makes manipulating multi-channel elements a lot easier. The Master Tile gathers together Automation controls & Mute Group buttons alongside a Master Fader (which can be assigned and locked to any signal path), the Focus Fader (which can either follow the selected path or be locked to a specified path), and a set of assignable user keys. The Tile also features our flexible Solo and Talkback system. Two individual Solo Buses, each with dedicated push/select level controls, feed three Solo Channels which might be used for example with a wedge, headphones and in ear feeds. A mini matrix of Solo Select and Output Select buttons allow routing of either or both solo buses to any or all solo outputs quickly and easily. There are two Talkback channels, each of which can feed Auxes and/or direct outputs and have dedicated controls and routing buttons that follow the same logic. The default solo source for each Solo Channel can be sourced from anywhere within the Live system (including Matrix outputs) or from six external solo inputs. A new Broadcast Solo mode contains features typical in broadcast applications, including Solo Dim for each Solo Channel and an Auto Dim feature. Solo & Talkback do not consume resource from the overall console path count. For those who prefer hands on hardware the Channel Control Tile provides an expanded set of hardware and touch screen controls for the selected Channel. It features an 7.5” high res touch screen surrounded by 15 rotary controls. Dedicated button panels below for EQ, Dynamics, Panning and insert effects instantly call groups of parameters to the tile controls. Above the screen, additional sets of controls call Input and Delay parameters to the controls and a rapid access button set calls channel configuration parameters including Auxes, Stem Groups, VCA’s and Mute Groups to enable channel configuration using hardware controls instead of the main touch screen. As you would expect from the company that first introduced console automation over 30 years ago, SSL Live consoles feature an automation system that benefits from our unrivalled studio and broadcast background. Automation is controlled via a full hardware interface in the Master Tile or via a software interface that can be manipulated via the main touchscreen or Channel Control Tile screen. The Automation interface can also be displayed on the optional external monitor. The system can store virtually unlimited automation scenes. Extensive filters enable the user to choose exactly what settings the console stores or recalls, not just on a global basis but also on a per scene basis. Scene groups enable absolute or relative editing of all selected scenes in a single operation. Scenes can be triggered manually or from external triggers. Scenes even include the Eyeconix images and display brightness settings.